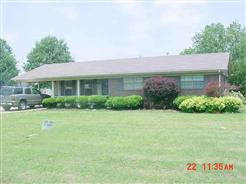 A new Dyersburg HUD foreclosure was listed this morning at 164 Williams Lane just outside Dyersburg. This is a 3 bedroom 2 bath brick home with 1325' heated and cooled area. Looking at the sold listing from 2006, there appears to be an in ground pool in the back yard. This home last sold for $109,900 on June 6, 2006. The list price is $72,000. This property is listed by a company in Germantown. More info is available under the HUD Homestore tab on the right but if you want to view this home, call or text Mike at 731-589-7841.